Somewhere, sometime. You have to start. July 20, 2015. It was a Monday, of course, starting on a Monday is cliché, but like the saying goes….You have to start sometime; so Monday it was. Somewhere was more meaningful. Backyard? Park? Trail? Sidewalk? In the end, leaving the house was the important part. Escaping daily routine and distractions is easier said than done. “Your goal is too big!” “You don’t know what you are getting into!” “I’m not fit enough.” “I don’t have enough money.” “You don’t have enough time.” Thoughts and people’s opinions get in the way of starting somewhere and starting sometime. Monday. July 20, 2015 at the backdoor of my house. I started. Not knowing where it was leading I took my first steps, bounding down the stairs to the driveway and reaching the sidewalk. I turned right and headed into the village. It was a beautiful evening and I set my pace quickly. As I walked, I smiled at everyone and no one. My soul filled with the joy of “starting.” My feet led me to a walking path. Not very exciting. Keeping positive I rounded the bend and saw it. The Joe Panza Nature Trail. It was pulling me to enter enticing me with the promise of cool shade and solitude. 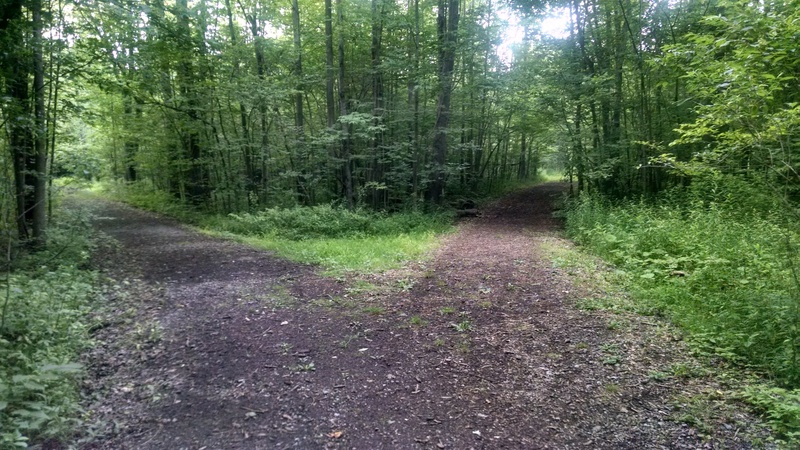 I did not resist the pull and easily walked into the trail head framed by tall trees. With no small goal in mind when “I started” I realized there were many choices on this trail. Left, right, straight, turn around? I would never, ever turn around. Right then and there I set a goal. 3.1 miles or otherwise known as a “5K.” It seemed a realistic goal and checking my pace, I found out I was half way there already. With new confidence I quickened my pace around the nature trail, walking out of the woods and around the walking path, out of the park and I wasn’t going home until I hit my mark. The daylight was fading as I walked out of the park. I needed more distance and hurried around the Fireman’s Park and put blinders on past the cupcake shop. I realized I was still short of 3.1 miles. Walking home a little more slowly, I passed St. Aidan’s church. I remembered the labyrinth they maintain in their backyard. That will do it! I paused just briefly before entering the labyrinth, remembering my bigger goal of hiking the Appalachian Trail. I took the first little step and wound my way around the flowers and stones, breathing deeply as the meditative motion pulled me to the center. The little red bench beckoned a short pause in my journey. I pulled away from the center and wound out of the labyrinth making my way home. The sidewalk was flat and easy to walk as I checked my pace. 3.2 miles. I knew my bigger goal was possible because. I Started. Author trailchaser2020Posted on July 21, 2015 July 22, 2015 Categories appalachian trail, exercise, hiking, nature, walkingLeave a comment on Somewhere. Sometime.